Click on the links below to download and print forms. If you are a new patient to Healing Essentials, reguardless of the type of treatment you will be receiving (the exception being the Thai Tibetan Aroma Oil Massage), you are required to fill out the Initial Visit form as well as the Informed Consent form and you will need to bring these with you for your first visit. Forms are also available at our office. If you are scheduling an appointment for someone under the age of 18, the Consent to Treat a Minor will have to be completed as well as the basic forms. For Prental Massage Treatments you will need to complete the Prenatal Personal information form which is specific for each pregnancy. For the Thai Tibetan Aroma Oil Massage please fill out the Health History Form specifically designed for that treatment. 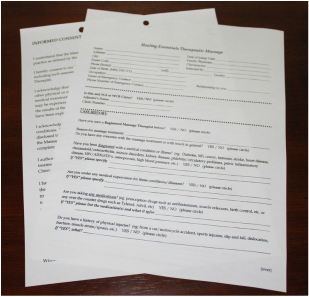 If you are new to our office and are scheduled for this treatment, this is the only form you will need to complete. All treatments are payable by cash, cheque or e-transfer at the time of your appointment.